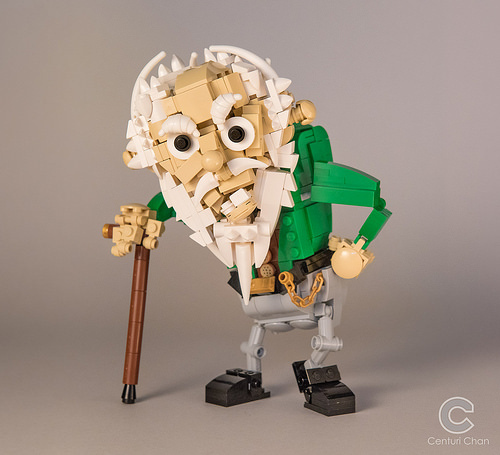 Meet Ol’ Barney, an opinionated, grumpy old man created by Centuri. His fingers are gnarled, his bones ache when it rains, those teeth have done a lifetime of chomping and you’re going to need to speak up boy! Ol’ Barney has some fun parts use by Centuri. Some of the ones I spotted are the white croissants for his eyebrows, tan hair for his ears, a gold ingot belt buckle and what could better be better than ‘knobbly knees’ made of Technic connectors.